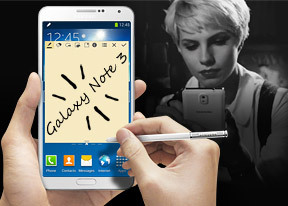 The Samsung Galaxy Note 3 features a wide array of advanced features and applications that really make it stand apart from other flagships. One use case is to play a music track on the Samsung Galaxy Note 3 and use multiple phones as speakers. You can pick the role of each phone (e.g. left channel, right) all the way up to surround sound. This way you can control the music from one phone but use the loudspeakers of all. Of course, the other phones will need to support Group Play - the phones communicate over Wi-Fi (your Galaxy Note 3 becomes a hotspot that others connect to) and the pairing is done via NFC. More useful are the options to share a picture or a document - you can have the same picture appear on everyone's phone and you can draw over it if you need to highlight a certain element of the image. Finally, perhaps the coolest feature of Group Play is that it allows for multiplayer games to be played on several phones simultaneously. Of course, only supported games work - there was a poker and puzzle games preloaded on our unit with Asphalt7 and Gun Bros offered as other games that support Group Play multiplayer. Multi Vision on the Samsung Galaxy Note 3 allows you to stack up several devices and get a bigger resulting screen area for your content. If your friends rock a Galaxy Note 3 you can team up and create a cool video watching experience. Check out how the feature works in our short video shot at IFA 2013. Samsung WatchON is the primary app used with the built-in IR emitter on the top of the phone. The app starts out by asking your zip code and pulls up a number of TV service providers in that area. This is so that the app can show you a TV guide with shows currently on or upcoming on the channels offered by the service provider. You can read a description of the show, check out its popularity in up/down votes (and vote yourself, of course) and comments. You can also set reminders for shows you want to watch. Anyway, the key element of the app is the IR remote control functionality. The app can control TVs, DVD and Blu-ray players, streaming media players and air conditioners. Devices are organized by rooms. One thing we really liked about the app is that it knows some home setups are messy - some let you change channels with the TV remote, others require you to use the set-top box remote for that. Same for the audio, you might be using the TV to output the sound or an AV receiver. The app will ask about your setup and present a unified remote control interface even if you have multiple hardware remotes to control all the devices. Finally, S Health is Samsung's home-brewed health and fitness tracking application. It starts off by getting you to create a profile which includes all your vital statistics, such as age/weight/gender and level of activity, plus your calorie consumption goals. It provides a pleasant interface which gives you an at-a-glance look at your progress, as well as walking, exercise, and fitness trackers, plus you surrounding environmental influences, such as temperature. S Health also supports a number of optional accessories, which enables it to give even more detailed info on your status. Hubs are not just for Windows Phone - Samsung, at least, seems to think so. And while before there used to be several different applications for the various Samsung Hubs, in the latest TouchWiz they're all accessible from one centralized Samsung Hub location. One thing you can see right off the bat when accessing the Hub is absence of any social networking features. Samsung has dropped Social Hub features found in TouchWiz versions of old, leaving you to traditional dedicated apps for your social networking fix. Otherwise, the new Samsung Hub gives you access to stores for books, games, and educational material in a markedly Windows Phone-esque style. The Music Hub lets you browse music online (with search tools, charts, lists of new releases and so on). You can preview songs (30 seconds each) and buy tracks or whole albums. Each of the sections take you to the respective stores. You can either buy digital magazines, books and online newspapers from the Book Store, browse and play either Social or Premium games in the Game Store. The latter features a try-before-you-buy option, as well as titles by Gameloft and EA, which are otherwise not available on the Google Play Store. Unlike previous Galaxy flagships, the Galaxy Note 3 gives you only the Polaris Office viewer functionality, rather than the full-fledged editor. The viewer does not show up in your app drawer, but instead only opens when you select the relevant document from the My Files app. Nevertheless, you can view most document types, including PowerPoint, Word, Excel as well as PDF. We suspect Samsung will make sure a full-fledged editor is available for download from the Samsung Apps by the time the smartphone goes on sale, but even if it doesn't there's plenty of alternatives in the Play Store. The Samsung Galaxy Note 3 features a decent alarm clock application which allows a huge number of alarms to be set, each with its own start time and repeat pattern. There's also a World clock, stopwatch, and timer. They are easy to work with and can come in handy. The Samsung Galaxy Note 3 comes with a GPS receiver, which got a satellite lock in couple of minutes with A-GPS turned off. A-GPS can speed this up quite a bit, but requires Internet access. The barometer, however, can speed up GPS locks even without a data connection. We gotta say, we didn't experience any issues with the GPS performance. The Galaxy Note 3 comes with Google Maps and Navigation. Voice-guided navigation has become a viable solution since the v5.0 update. Vector maps are smaller and easier on the data traffic and reroute is an option if you go off course without the need to connect to the Internet. In fact, the only time you need a data connection is when you initially plan the course - Navigation will cache the needed maps. Samsung has naturally included its own Apps store. It features largely the same type of interface as Google Play, except here you'll find a far lower number of apps. The good news is Samsung uses this repository to distribute some exclusive titles and some promotional offers, available only to its customers.